Khan, Q., J.P. Faguet, C. Gaukler and W. Mekasha. 2014. 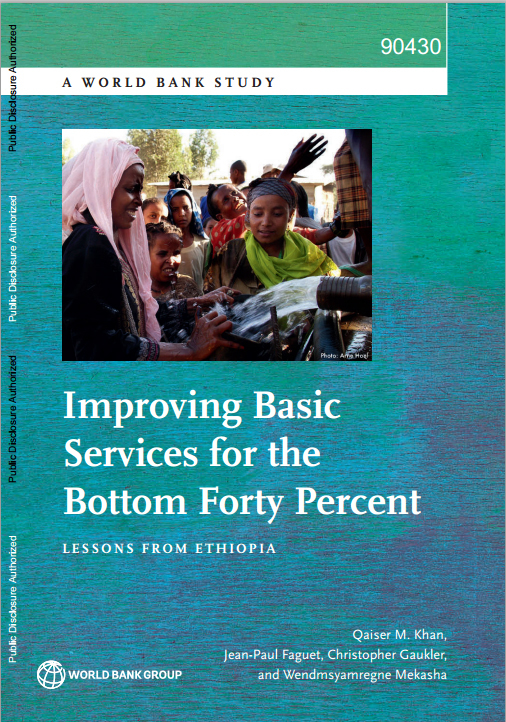 Improving Basic Services for the Bottom Forty Percent: Lessons from Ethiopia. Washington, D.C.: World Bank. Choice is a luxury for the poor in developing countries and development is about increasing choice and opportunities. The main asset of the poor being their labor, improving the quality of this labor through better access to basic services is a key to improving opportunities and choice. On Wednesday 8 October, the International Development department hosted a public lecture to launch a new book investigating the drivers of Ethiopia’s remarkable progress in extending basic education, health and agricultural services throughout the country, and especially to the poorest 40% of the population. The book is published by the World Bank, and authored by Qaiser Khan, Chris Gaukler and Wendmsyamregne Mekasha of the World Bank, and our own Professor Jean-Paul Faguet. Dr Khan presented the book’s main findings, and was joined on a panel by Marta Foresti, Director of Politics and Governance at ODI, and Peter Hawkins, Head of Profession for Programme Management at DFID. Professor Faguet chaired the panel. The event was very well attended, and the Q&A session featured a lively mix of technical questions and opinionated remarks. A free electronic copy of the book is available in its entirety, courtesy of the World Bank. A talk discussing the book, recorded at the LSE, is available as a video on LSE’s website. The main findings of the study are as follows, taken from the book’s Executive Summary. Ethiopia, like most developing countries, has opted to deliver services such as basic education, primary health care, agricultural extension advice, water, and rural roads through a highly decentralized system. That choice is based on several decades of theoretical analysis examining how a decentralized government might respond better to diverse local needs and provide public goods more efficiently than a highly centralized government. Ethiopia primarily manages the delivery of basic services at the woreda (district) level. Those services are financed predominantly through inter-governmental fiscal transfers (IGFTs) from the federal to the regional and then the woreda administrations, although some woredas raise a small amount of revenue to support local services. Since 2006, development partners and the government have co-financed block grants for decentralized services through the Promoting Basic Services (PBS) Program. Aside from funding the delivery of services, the program supports measures to improve the quality of services and local governments’ capacity to deliver them by strengthening accountability and citizen voice. This study attempts to determine the extent to which spending at the woreda level on basic services is associated with key policy outputs and human outcomes. Woreda-level block grants primarily support locally recruited staff who provide basic services in five sectors (health, education, agriculture, water and sanitation, and rural roads). Because of limitations in the data, the analysis focuses on health, education, and agriculture. A parallel objective of the study is to assess the incidence of these expenditures by wealth quintile, in line with the World Bank’s objective of achieving shared growth by reaching the bottom 40 percent. A final objective is to investigate whether the allocation of woreda-level block grants reflects the constitutional objective of providing additional resources to historically marginalized populations. In other words, how effective and equitable is spending on basic services at the woreda level? The study also looks at the effectiveness of efforts to improve financial transparency and accountability, social accountability, and grievance redress mechanisms, because of their strong influence on the availability and quality of basic services. Ethiopia’s model for delivering basic services appears to be succeeding and to confirm that services improve when service providers are more accountable to citizens. As discussed in the World Development Report 2004, accountability for delivering basic services can take an indirect, long route, in which citizens influence service providers through government, or a more direct, short route between service providers and citizens. When the long, indirect route of accountability is ineffective, service delivery can suffer, especially among poor or marginalized citizens who find it challenging to express their views to policymakers. In Ethiopia, the indirect route of accountability works well precisely because of decentralization. Service providers are strictly accountable to local governments for producing results, but in turn, the local authorities are held accountable by the regional and federal governments. A degree of local competition for power and influence helps to induce local authorities and service provides to remain open to feedback from citizens and take responsibility for results. The direct route of accountability has been reinforced by measures to strengthen financial transparency and accountability (educating citizens on local budgets and publicly providing information on budgets and service delivery goals), social accountability (improving citizens’ opportunities to provide feedback directly to local administrators and service providers), and impartial procedures to redress grievances (instituting the independent Ethiopian Institution of the Ombudsman, for example). Woreda-level spending, financed through IGFTs and supported by the PBS Program, has been a very effective strategy for Ethiopia to attain its Millennium Development Goals (MDGs). Spending on health and education accounts for 80 percent of PBS-financed spending by the woredas, which goes to pay for health extension workers (HEWs) and teachers. Although the link between numbers of personnel hired and services delivered must be treated with caution (and is being explored in detail in another study), this study finds evidence that woreda-level spending in health and education is effective. Owing to the intervention of HEWs, the use of health services has increased, especially among the poorest quintiles. Every additional US$ 1 of per capita spending by the woredas on health is associated with a 6.4 percent increase in the contraceptive prevalence rate and an 11.3 percent increase in deliveries by skilled birth attendants (two interventions that can reduce maternal mortality dramatically), as well as a 3.6 percent increase in antenatal care (which can reduce infant and child mortality significantly). For education, an increase of US$ 1 per capita in spending by each woreda is associated with a 3.6 percent increase in the net primary enrollment rate within that woreda. Similar results are seen for the pupil-teacher ratio. Finally, the effect of woreda-level spending on agricultural extension workers is associated with higher yields for major crops, including cereals, vegetables, enset, coffee, and fruit. Spending on agricultural extension workers increases the probability that farmers, regardless of the size of their plots, will use improved farming techniques. Education, health, and agriculture account for 97 percent of woreda spending, which in turn constitutes 97 percent of PBS-financed IGFTs. This is complemented by support for greater engagement among citizens, improvements in local capacity to manage resources, and better access to information on national and local budgeting and development objectives. While it is difficult to provide precise estimates of the impact of the latter activities, the direction of their effect is clear: Spending efficiency is improved through better capacity, more transparency, and greater accountability to citizens. In interpreting these results, it is important to bear in mind that the chain of causality from woreda spending to results is direct for education: Spending on teachers directly drives enrollments. For health and agriculture, on the other hand, spending at the woreda level on health and agricultural extension workers is best described as catalytic, because it increases the effectiveness of system-wide spending (federal capital investments in medical infrastructure, for example, or national research to develop improved varieties for farmers). Yet overall, these findings demonstrate the power of the PBS-financed decentralized approach for improving access to basic services, encouraging broadly shared development, and propelling Ethiopia rapidly toward the MDGs. The social accountability component of the PBS Program has increased the opportunities for constructive collaboration between citizens and the state to improve basic public services in pilot areas. Even though woredas must operate under federal guidelines, they still exercise a significant amount of discretion that can affect the quality of life and services. More than 84 percent of those surveyed in pilot areas responded positively to social accountability initiatives, which had increased citizens’ awareness of their rights, responsibilities, and entitlements to basic services. After service providers and users drew up joint service improvement plans, basic services improved, and so did the quality of the engagement between citizens and service providers. Through the financial transparency and accountability component of the PBS Program, citizens have become more aware of the government budgeting process, and they are advocating more effectively for their rights as a result. The PBS Program has also improved the efficiency of resource use by improving financial management and procurement capacity at the woreda level. Grievance redress mechanisms are another means of ensuring that citizens’ voices are heard with respect to government services. A grievance redress mechanism provides the opportunity for an impartial third party to review a transaction that has taken place between the government and a citizen or a group of citizens. Through dialogue and technical and financial support, the PBS Program is strengthening the Ethiopian Institution of the Ombudsman and the regional Grievance Handling Offices, which offer these services. Overall, the benefits of PBS-financed spending at the woreda level on health, education, and agriculture accrued to all income levels. Woreda-level spending on health and education is particularly pro-poor: 58 percent goes to the two bottom wealth quintiles. In agriculture, woreda-level spending (primarily for agricultural extension workers) drives increases in output and the adoption of new, improved methods across all asset quintiles, although the magnitude was smaller for the bottom quintile, perhaps because of a lack of financing to purchase productivity-enhancing inputs. Spending on basic services also appears to be reaching females, especially spending on health and education. In fact, health spending is undeniably pro-female, given that much of it promotes women’s access to services that have a strong impact on reducing maternal mortality—including contraception, antenatal care, and assisted deliveries. Education is the only sector for which expenditure can be associated with data on results, disaggregated by gender, albeit for only two indicators—net enrollment rate and net intake rate at the primary level. The coefficient for female primary school students is slightly higher than for males for both net enrollment and intake, although not significant. The important finding is that no bias against females was found in expenditure on education, the sector that receives the bulk of PBS Program funds. The results on agriculture tell a somewhat different and less clear story. Eighty-seven percent of Ethiopia’s farmers are male, and access to extension services was found to favor males. It is not certain whether this bias is driven by gender differences in crop choices, the quality of land farmed by men compared to women, or some other inherent gender bias. Further analysis is required to clarify these issues and develop policy responses based on the evidence. A final important question related to equity is whether PBS Program resources channeled to the woredas are reaching Ethiopia’s historically disadvantaged regions and ethnic groups. The answer appears to be that in terms of basic service expenditure per capita, the current system broadly favors Ethiopia’s historically disadvantaged regions compared to the historically dominant ones. More than 50 percent of the woredas in Gambella and 30 percent in Beneshangul-Gemuz—the two most disadvantaged regions of the country—spend more than 110 percent of the national average on the basic service sectors. Spending also appears to favor some historically disadvantaged ethnic groups, in accordance with constitutional mandates. Five majority-Anyiwak woredas are noteworthy for receiving the most public resources of all woredas in the nation. The exception occurs among the Somali groups. Federal transfers to Somali Region appear to be fine, but the region transfers a much smaller share to the woredas—49 percent, compared to the national average of 73 percent (excluding Addis Ababa) over the four years studied here. Decentralized spending at the woreda level is both effective and pro-poor. The estimates provided here imply that the returns to this spending are far from decreasing, which means that Ethiopia has scope to increase spending and speed its attainment of the MDGs. The current approach also appears to be helping some of Ethiopia’s historically disadvantaged areas and ethnic groups to catch up with the rest of the country. Expenditure to provide basic services at the woreda level is broadly equal across Ethiopia’s woredas, with the striking exception of a small number of woredas that are concentrated in the country’s most disadvantaged regions and receive significantly greater resources. Resource flows are lowest among the more developed, historically dominant regions. In contrast to the predictions of some public management theories, the decentralized provision of services in Ethiopia is not increasing regional, ethnic, or gender inequalities in investment inputs or service outputs. Indeed, the opposite seems to be true for education and health, where the impact of PBS-financed IGFT resources was disproportionately high among the bottom two quintiles and women. In sum, support for decentralized services in Ethiopia appears to be an effective use of development partners’ resources from both an efficiency and equity perspective. The only exception to these findings is agriculture, for which the impact of PBS-financed IGFT expenditure was smaller for the bottom quintile. In this instance, a wide array of factors is likely to be at work, not the least of which could be poor farmers’ inability to pay for productivity-enhancing inputs, land of poor quality, or water management issues that could not be controlled for in the analysis (except for rainfall). Although quantitative evidence is unavailable at present, descriptive evidence from the first phase of the Ethiopia Social Accountability Program implies that structured feedback sessions involving citizens and service providers are strengthening citizens’ participation in pilot areas. That evidence, together with the strong guidance emerging from governance and accountability theory, argues for the continued application of social accountability tools and the development of policies to sustain their use in the Ethiopian context. This conclusion can be verified when the impact assessment for the second phase of the Ethiopia Social Accountability Program becomes available. The difficulty of conducting subnational empirical work on Ethiopia cannot be overstated. Creating the database for this study required considerable effort and improvisation on the part of the research team. The resulting standardized database of woreda-level expenditures and characteristics, which will be made public, is a major output of this study. The data will be augmented with new data collected under the third phase of the PBS Program and used in future research related to the program. It is hoped that in time this dataset will become a useful tool for researchers and students elsewhere in Africa and beyond. See Faguet, J.P. 2012. Decentralization and Popular Democracy: Governance from Below in Bolivia. Ann Arbor: University of Michigan; also Faguet, J.P., and F. Sánchez. 2014. “Decentralization and Access to Social Services in Colombia.” Public Choice, 160(1-2): 227-249. DOI 10.1007/s11127-013-0077-7. The Ethiopia section of an on-going, multi-country study (Woldehanna, Tsehaye, and Hill, forthcoming) also finds that spending on primary education in Ethiopia (which is mostly managed by the woredas) is pro-poor—more so than overall spending on education (33 percent goes to the two bottom wealth quintiles).